Meigs junior Zach Bartrum (1) strolls into the end zone for a touchdown during the first quarter of Friday night’s TVC Ohio football contest against Alexander in Rocksprings, Ohio. 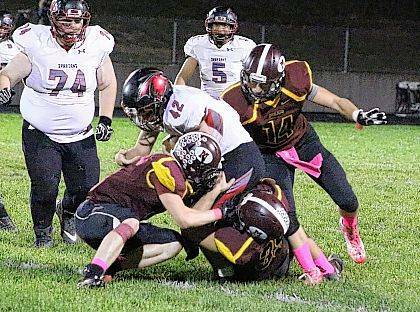 ROCKSPRINGS, Ohio — The host Meigs Marauders opened up a 28-0 first half lead and coasted to a 40-0 win over the Alexander Spartans Friday night at Holzer Field/Farmers Bank Stadium. Eleven seniors closed out their careers in the maroon and gold in triumphant fashion as Elijah Smith, Zach Helton, Christian Maddox, Bailey Caruthers, Lane Cullums, Mathew Brown, Wayland Ramage, Riley Ogdin, Andrew Douglas, Trenton Durst and Jimmy Porter celebrated one last night on the gridiron. Marauder coach Mike Bartrum substituted freely throughout the contest, a several new players saw action early in the first period. The Marauders won the toss and received the opening kickoff, Meigs put together a 12-play, 93-yard drive that was capped off when Lane Cullums blasted over from seven yards out at the 7:03 mark of the period. Meigs forced a four-and-out and took over at their own 40. On first down, quarterback Zach Helton scrambled for 26 yards to the Spartan 34. Zach Bartrum then took it the final 34 yards for the score. Helton hit Bailey Caruthers for the extra points and with 4:27 left in the first period Meigs was on top 14-0. A pass from Helton to Bartrum on third down and 10 went for 35 yards and set up the third Marauder score of the night. Bartrum scored from five yards out to cap off the drive. Late in the first half, the Spartans drove to the Meigs 16. On fourth and seven, Marcus Spauding came on to attempt a 23-yard field goal. Cole Adams blocked the attempt and the junior scooped up the loose ball and took it 77 yards for the score with 1:08 left in the half. Bartrum added the extra points and Meigs went into the locker room with a 28-0 lead. The score by Adams on the blocked kick was the junior’s fourth special teams touchdown of the season. Meigs added a score with 3:43 left in the third period when Bartrum took a snap in the wildcat formation up the middle 35 yards for the score. The Marauders scored the game’s final touchdown with 10:44 left in the contest when Helton hit senior classmate Christian Maddox over the middle from 11 yards out and the score. Maddox played for the first time since the first period of the opener against Gallia Academy when he suffered a serious knee injury. Christian playing with a bulky brace caught two passes for 25 yards in limited playing time. 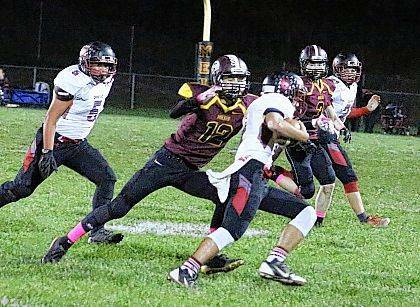 Bartrum led Meigs with 95 yards in only eight carries, Cullums added 50 in eight tries, and Helton 29 in six attempts. Helton was 7-of-11 through the air for 110 yards, while Cory Cox was 1-of-1 passing for 31 yards. Caruthers caught two for 43, Bartrum two for 39, Maddox two for 25 and Helton on a throwback pass, one for 31. Conner Kimbrough led the Spartans with 75 yards in 13 attempts, Bradley McCollister added 13 carries for 44 yards. Kimbrough was 4-of-7 in the air for 33 yards, while Kaleb Easley threw five passes and failed to complete any. Easley caught two passes for 18 yards, Matthew Brown added one for 13. Meigs finishes the season 4-6 overall and 3-3 in the TVC Ohio Division. Alexander ends the year 1-9 overall and winless (0-6) in league play.